Howdy, partners, and welcome to Capital City! 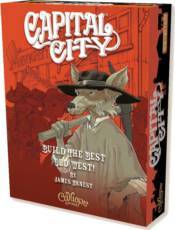 In this fast-playing card game, you've got one year to help build the most famous town in all the West! Each season, the train brings in city slickers and kinfolk from the east to help you run your new businesses on Main Street. Hire your workers carefully, keeping in mind that members of the same family help each other reach success faster! Dollars are useful, but victory points (VPs) are like pure gold! At the end of the year, the player with the most VPs wins the game and becomes the new Mayor of Capital City! Bring home a little piece of the wild west today! In more detail, players have four rounds represented by the seasons of the year to expand their Wild West town! First, they bid for player priority order for the current season. Next, they choose character cards from the train to put to work, then purchase building cards to form Main Street. Then, players attach character cards to the building cards to earn dollars or VPs! Attached characters are workers that provide bonuses to the current player and other players with characters from the same family! At the end of four seasons, the player with the most VPs wins! Yee-haw!